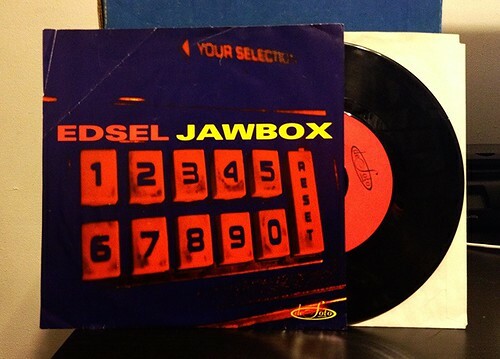 I Buy Way Too Many Records Dot Com: Edsel / Jawbox - Split 7"
Much like I did with Seaweed a few years ago, my mission now is to amass the entire discography of Jawbox. I'm not really going out of my way to hunt anything down, but I am picking up the pieces when I see them. This split 7" popped up in the used section of an online distro that I frequent, so I added it to my cart during a recent order. It ended up being a bit more beat up than I anticipated, so this may end up only acting as a place holder until I find a better conditioned copy. The Jawbox side was no real surprise here. The song is "Savory" which is also on their full length For You Own Special Sweatheart. It's just a tremendous song though. Dark and ominous, without being brooding or over the top. Plus, they still manage to sneak in enough hooks to keep me a happy camper. Edsel is a band I'm admittedly not as familiar with. Sure they are fronted by Sohrab Habibion, now in Obits, but I don't really like most of the Sohrab Obits songs. I can't say I was expecting much from their contribution "Penaluna," but it's actually not bad at all. With high pitched, but gentle vocals and lead heavy guitar work, it holds up reasonably well to the Jawbox side. If anything, it reminds me of some of the lower key Pixies songs, but Sohrab never freaks out the way Frank often does. Nice find. I'll have to keep an eye out for that one. Hopefully I'll find some great stuff at a record show happening here in September.